(Bloomberg) -- Nobody saw it coming. 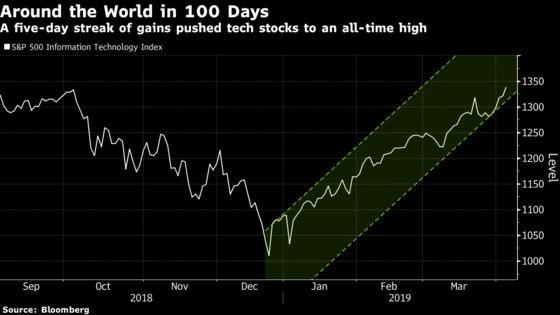 Not hedge funds that cut technology stocks to the lowest levels since 2016, not retail investors who pulled $8 billion from funds tracking the sector. Now, after the worst sell-off of the bull market, it’s taken just 100 days to erase the whole thing. Up in 13 of the last 14 weeks, the S&P 500 Information Technology Index gained as much as 1.3 percent to 1,338.77 Wednesday, briefly exceeding its Oct. 3 high of 1,332.87. Down 24 percent on Christmas Eve, the index has snapped back 32 percent, driven by gains exceeding 50 percent from Advanced Micro Devices to Xerox Corp. and Xilinx Inc.
Nerves that got twisted in the fourth quarter by everything from interest rates to trade wars and antitrust rhetoric have loosened back up after the Federal Reserve turned dovish and Apple Inc. arrested its plunge. The sector is having its best start to a year since 1998. Apple, which spooked investors with its first revenue forecast cut since Steve Jobs introduced the iPhone in 2007, is up 24 percent in 2019 after analysts from Citigroup Inc. to Needham to Bank of America Corp. defended the stock. Microsoft, the second most-valuable company after Apple, has advanced 17 percent this year amid optimism the firm will be among those spearheading a further growth in cloud. Then, there are semiconductor stocks, historically a highly cyclical industry, whose rally was derailed in late 2018 by shrinking demand from a broad group of customers ranging from smartphone makers to data center owners and exacerbated by the U.S.-China trade war. Investors have grown more optimistic that the worst is over and demand will recover later this year. From peak to trough in last year’s sell-off, tech stocks lost 24 percent in 82 days. While the index has posted similarly deep declines during the 10-year bull market, the swiftness of the late-2018 rout was uncommon. The last time a drop of a similar magnitude happened was in 2010, when it fell 17 percent in 70 days. At their worst point last year, chip stocks were down 26 percent from a March high. Since Christmas they’ve surged 37 percent, going by the Philadelphia Semiconductor Index. Advanced Micro Devices Inc. has gained 77 percent since Dec. 24, while MKS Instruments Inc. and Xilinx Inc. have rallied at least 63 percent.